My go-to meal for the last three weeks. 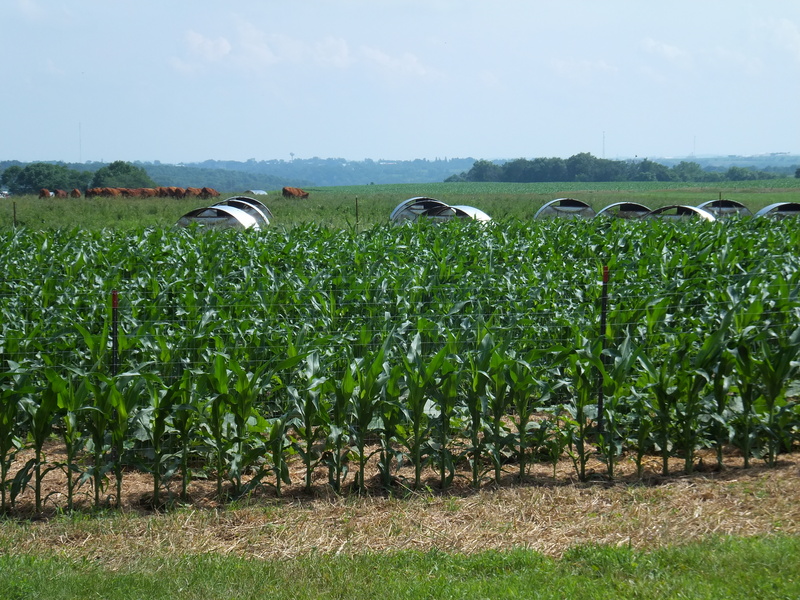 The sweet corn was raised without herbicides or pesticides. 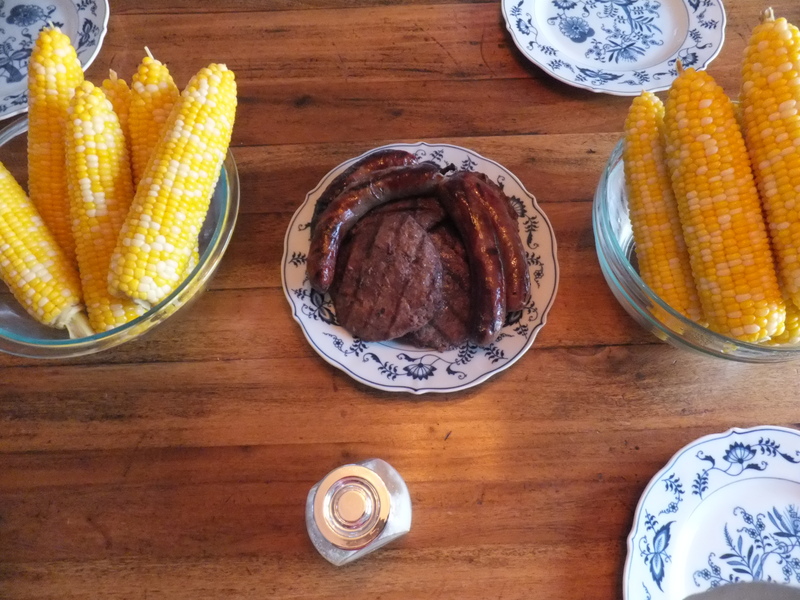 It’s a wonderful experience when a successful experiment results in such good eats. 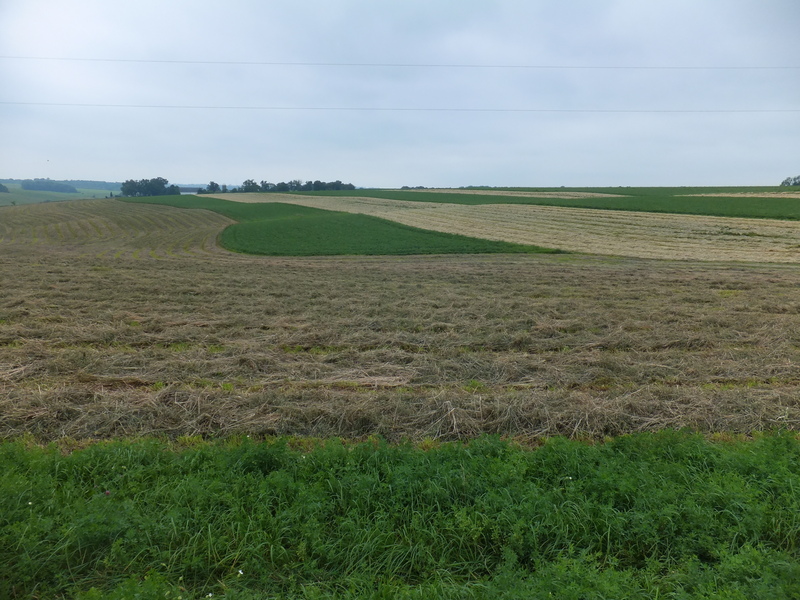 I planted a rye cover crop last fall, rotovated twice in the spring, rotary hoed twice after planting, and cultivated twice, keeping the corn ahead of the weeds long enough to produce a good ear of corn, even though the weeds are thriving now. 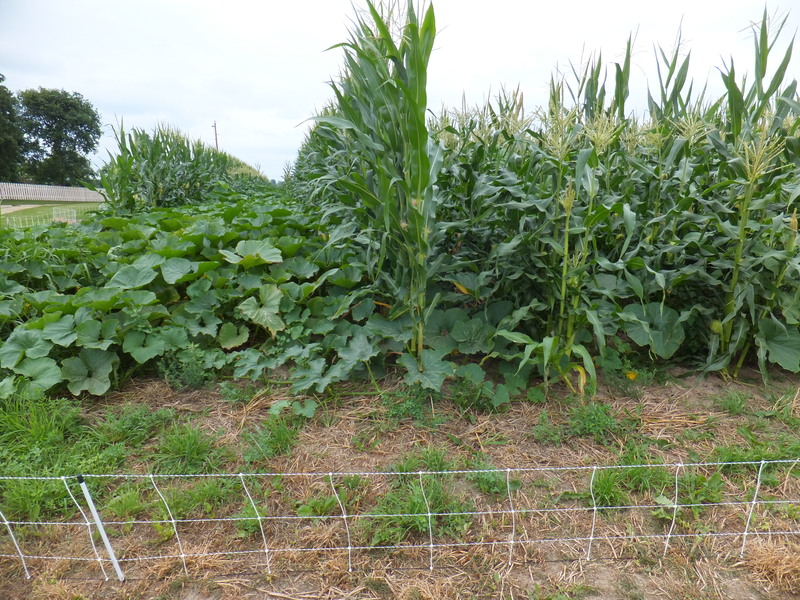 The last time I tried to raise sweet corn without herbicides was a disaster, with the weeds getting ahead of the corn, resulting in production losses. 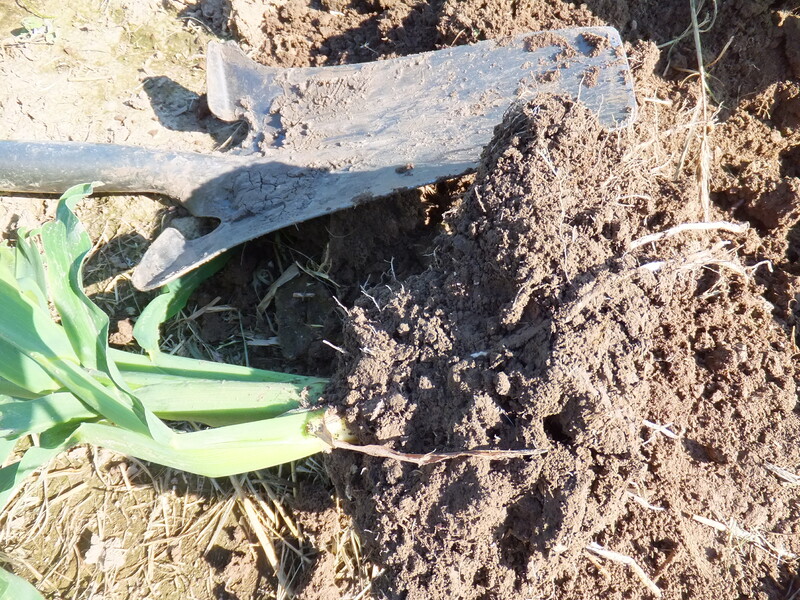 That time I only chisel plowed, disced, and cultivated once. 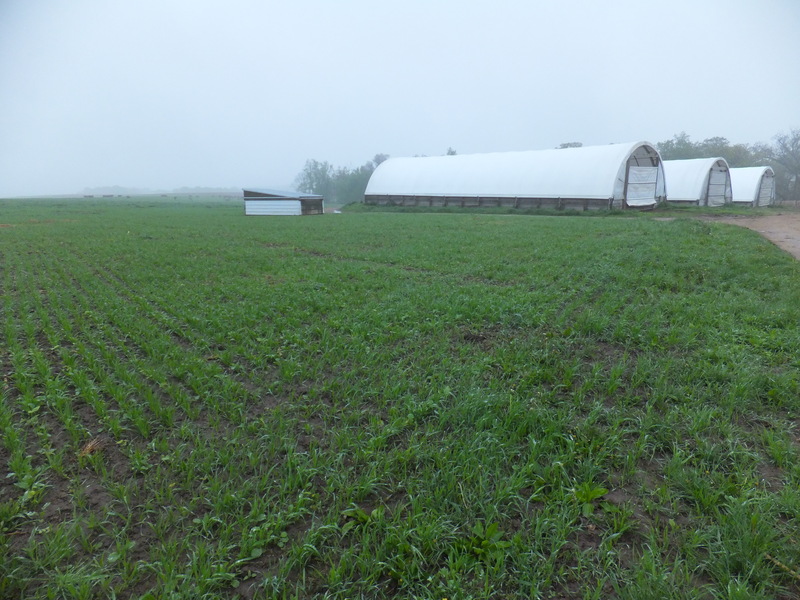 My plan for next year is to use the same protocol as this year, except possibly not using the rye cover crop. That may prove to be a mistake as the rye has alleopathic properties. I wonder if I should be looking at weeds differently. Instead of a problem to overcome, maybe I should consider them as a volunteer crop. Instead of weeding, maybe I should be harvesting. Tama Matsuoka Wong is a businessperson who has taken her interest in wild edibles to a new level. She partners with restaurants to put wild edibles on the menu. Her website is Meadows and More. Discovering the way Ms. Wong approaches wild edibles is invigorating my thinking about weeds. Finally, while I’ve spent the summer thinking about sweet corn, I wonder how much corn I’m getting from other sources. “Children of the Corn” is an interesting infograph if you’ve ever wondered about the corn industry. The one problem I have with the infograph is when they talk about water usage. Sure, corn uses water, but it gets cycled back into the atmosphere. It’s not like it’s being used up, never to be seen again. Comment if you have any thoughts about these topics. I made a rookie-type mistake planting my sweet corn. After planting my Dad’s field corn, I changed the population from 30,000 plants per acre down to 20,000 plants per acre, and I cleaned out each of the four seed hoppers in my John Deere 7200 planter. I’ve owned this corn planter for over five years, and I’ve cleaned out the hoppers the same way every time, (dumping them upside down several times), but this time one of the hoppers had quite a bit of corn stuck down inside where I couldn’t see it. Furthermore, when I started planting, that row was plugged and corn was not coming out. Luckily, the monitor tells me when a row isn’t planting, so I wouldn’t have planted the whole field with a missing row. 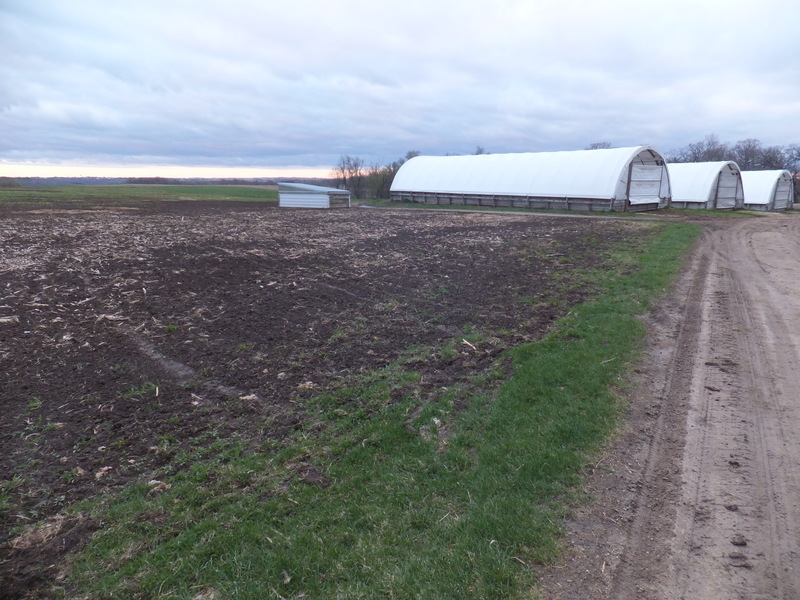 I unplugged the row and finished planting the whole field, stopping once to add another variety of sweet corn. I planted two varieties this year, both supersweet, but with different maturities. I noticed there was more corn in the second hopper, but figured that must have been because it didn’t plant that one time across the field. Fast-forward to a couple of months later. 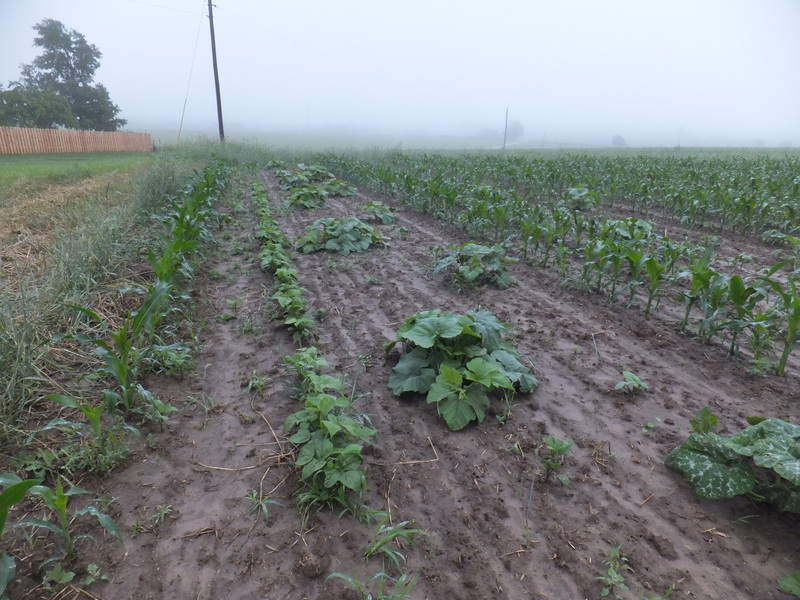 I noticed that the rows of corn were developing differently, but figured that must have been the difference in variety. Then we had a summer storm with strong winds. 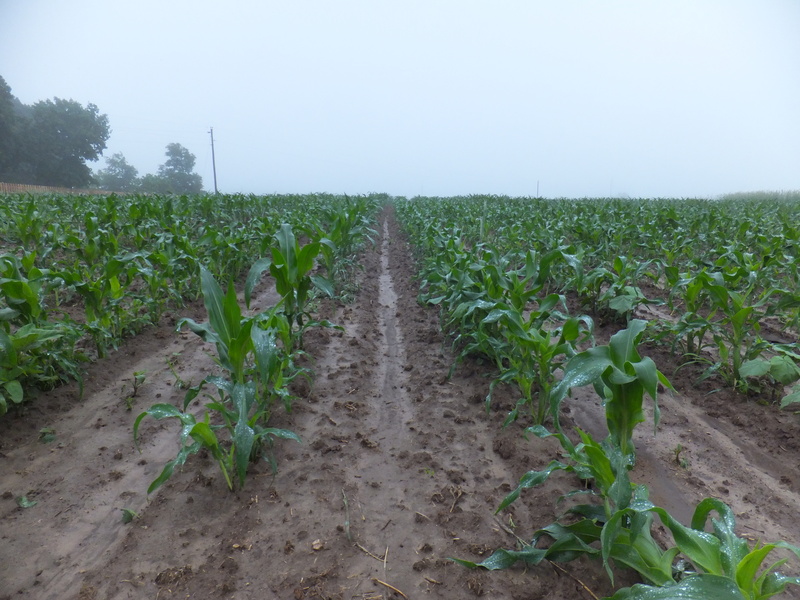 Most of the corn was bent over from the strong wind, but some of the rows were not affected. I still figured it was due to varietel difference. Finally, when the corn started tasseling, with the taller rows not tasseling, a light bulb went on and I realized what had happened. The tall rows were my Dad’s field corn. The next thought I had was, “Oh no, my sweet corn is ruined.” You see, supersweet corn needs to be isolated from other types of corn or the sugar in it turns to starch and it tastes terrible. This happened once with our sweet corn when I was a kid, and it was inedible. But then I realized that the sweet corn was tasseling, but the field corn was not. So if the sweet corn could pollinate before the sweet corn tasseled, I would be fine. I could have detasseled all the field corn to be safe, but you know me, my curiosity comes before my success. So now we wait and see. Next year I know exactly what I will do differently. I’m going to upend each hopper, removing all the visible corn. Then I will put the planter in the ground somewhere out of the way, and plant any remaining seeds until the monitor tells me each row is empty. On a side note, you can see the pumpkin and squash is growing gangbusters. In the foreground you can see a new purchase I made: Racoon Net from Premier fence. The three-strand electric fence I always made in the past helped, but didn’t completely keep the raccoons out of the sweet corn. I’m hoping this netting works better, and I’ll try to remember to let you know how it does. I cultivated between the rows on June 16th. The soil was quite dry. We received five inches of rain over the following four days. I snapped these photos the morning of June 20th. 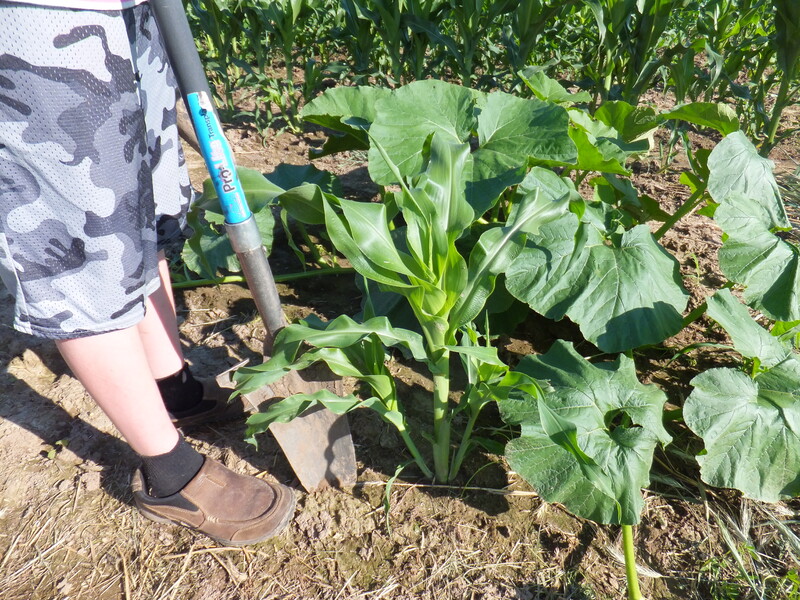 Now the corn is too tall for mechanical cultivation, so we are left with hand weeding. We’ve been doing some of that, especially around my garden area. That’s the beautiful thing with organic production, I can plant other crops amongst the corn and not worry about the herbicide killing them. The bottom photo shows where I ran out of corn for a couple of rows. Instead of panicking, I planted pole beans and squash and pumpkin in the empty rows. Since this picture was taken, I weeded and mulched and put up a fence for the pole beans to climb on and it’s looking pretty good. I have mixed feelings about the weed control. On the plus side, I definitely think I controlled the weeds enough that the corn yield will not be limited. Research shows that much of a corn’s yield potential is determined at a very small size, (around four leaves I think). But I can see a lot of weeds coming now. I wonder if I let them escape and go to seed will the weed pressure continually worsen? Maybe I have let too many weeds go to seed in the past? I can see the allure of using herbicide to achieve a “clean” field. It’s just that I can also see that there is no such thing as “clean”. Life is messy!